Since the auto industry employment low point in June 2009, the U.S. auto sector has added263,700 jobs as of January 2013. Employment in auto manufacturing (motor vehicle assembly plus motor vehicle parts manufacturing) has increased by164,600, for a26.4%gain since the trough. 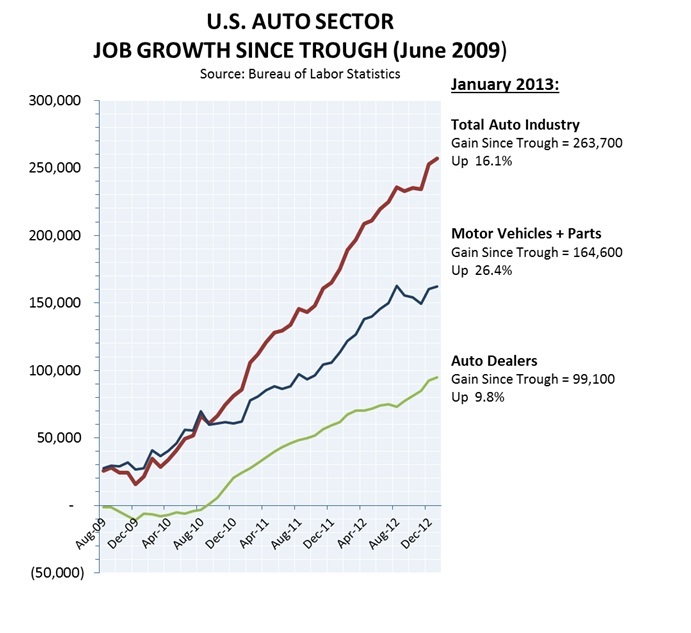 Auto dealer jobs have also grown by99,100jobs. 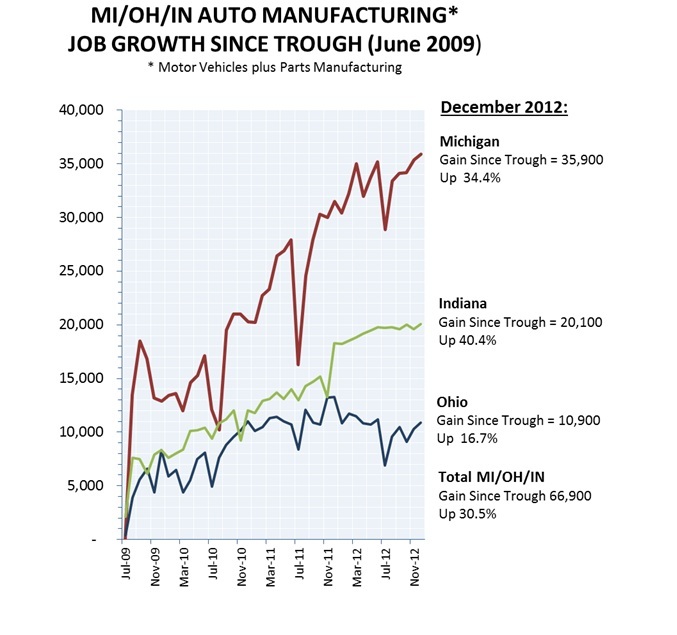 Michigan, Ohio and Indiana represent the largest concentration of auto manufacturing jobs, accounting for 36.2% of auto manufacturing jobs nationwideaccording to December 2012 figures, the latest month for which state-level data is available. Collectively, the three states saw an increase of 66,900 jobsin December, for a gain of 30.5% since the trough in June 2009. Michigan has seen the largest increase, adding 35,900 jobs for gain of 34.4%. Indiana’s auto manufacturing grew by 20,100 jobs for a gain of 40.4%. Finally, Ohio’s auto sector also is seeing robust growth with 10,900 jobs added for a gain of 16.7% since the trough of June 2009. 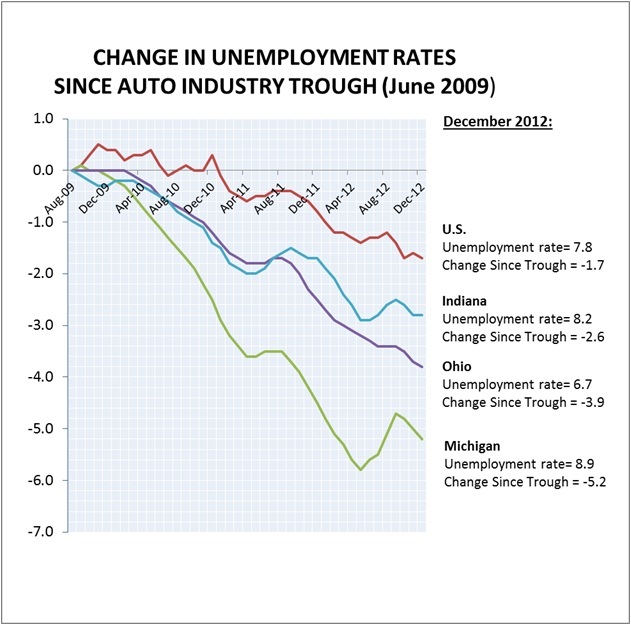 Since the auto industry trough, the unemployment rates of Michigan, Ohio and Indiana have decreased much more rapidly than the national average. As of December,the national average unemployment rate has droppped by 1.7 percentage points since June 2009 to 7.8%. However in Michigan, theDecember 2012unemployment rate has dropped over two times faster, by 5.2 percentage points to 8.9%.Similarly in Ohio, the unemployment rate has also dropped much faster than the national rate, by3.9 percentage points to below the national average to 6.7%. Finally, in Indiana, the unemployment rate has also dropped rapidly by 2.6 percentage points to 8.2%.